AMD is getting ready to unveil its 7th Generation APU lineup at Computex in a few weeks, but since our readers can’t wait that long, we thought we would post the specifications of AMD’s upcoming lineup of AM4 APUs anyways. The brand new processors will be landing in June along with the AM4 motherboards and will be the first to feature Excavator on the mainstream desktop platform. They will offer significant performance increases over the previous iterations of Kaveri and Carrizo (Mobility). All six SKUs fall into the full power (65W) or low power (35W) variants. All SKUs utilize the AM4 socket and support DDR4-2400 memory. It is worth noting that the boards supporting the AM4 socket will be landing next month in June. AMD will be revealing the platform at Computex in a few days and we expect to see the entire lineup of AMD’s 7th Generation APUs present there as well. Raven Ridge will be succeeding Bristol Ridge and will be based on the 14nm process with Zen cores. The flagship SKUs will have a total of 12 compute cores present on the package. Out of these, 4 will belong to the Compute side while the remaining 8 will form the Graphics side. The top end SKU will have 4 x86 Excavator based cores clocked at 3.7 Ghz (Turbo up to 4.2 Ghz) with 2 MB L2 Cache. This will be complimented by 8 GCN 3.0 CUs for a total of 512 Streaming Processors. The low power (35W) variant will be clocked at 2.9 Ghz (boost up to 3.8 Ghz). The performance tier SKUs in the lineup will have a total of 10 compute cores – divided into 4 for compute and 6 for graphics respectively. 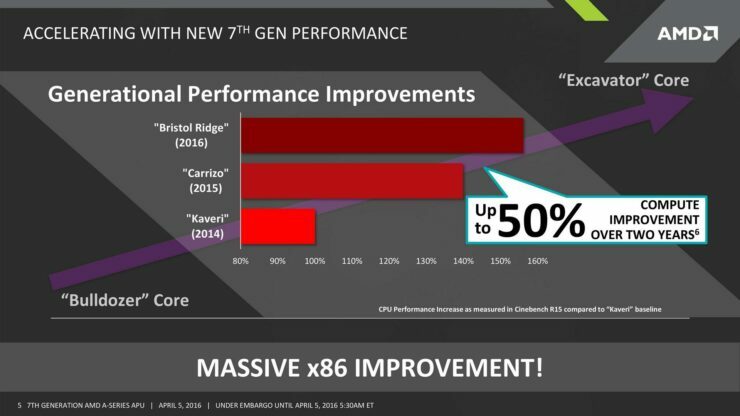 The x86 Excavator based cores will be clocked at 3.5 Ghz (Boost up to 3.8 Ghz) with 2 MB of L2 cache. The 6 graphics CUs house 384 GCN 3.0 cores. Clock rate of the GPU side of things is not known to us at the moment. The low power variant (35W) will be clocked at 2.8 Ghz (Boost up to 3.5 Ghz). The budget SKUs in the lineup will have a total of 6 Compute Cores. The two x86 Excavator based cores will be clocked at 3.5 Ghz (Boost up to 3.8 Ghz) and will share 1 MB of L2 cache. The graphics side of things will house 4 CUs with 256 GCN 3.0 stream processors. The low power variant (35 W) will be clocked at 3.0 Ghz (boost up to 3.4 Ghz). 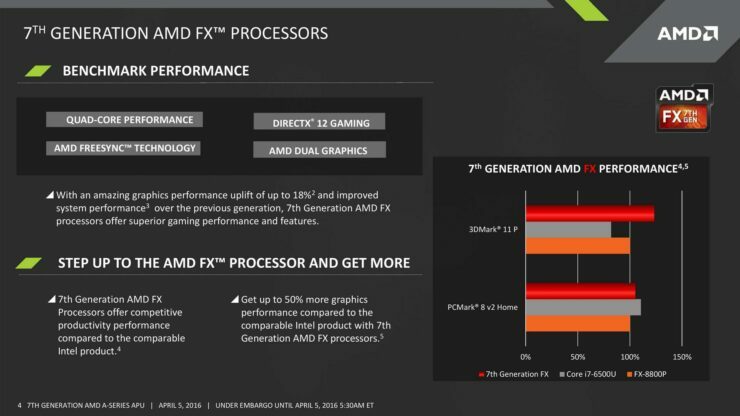 AMD’s new Excavator based APUs offer 50% more performance than their predecssor. 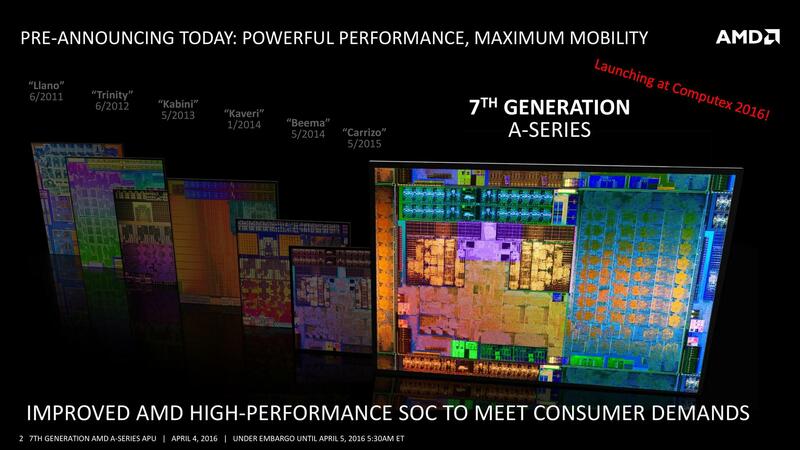 AMD’s 7th Generation APUs on paper appear to be very Carrizo-like in their specifications apart from the fact that they are full fledged desktop chips. The amount of GCN cores featured maxes out at 512. As mentioned above the processor architecture will be Excavator while the GPU architecture should be a revised iteration of GCN (dubbed GCN 3.0). Bristol Ridge APUs are going to have one very interesting feature: support for DDR4 memory, specifically dual channel DDR4 2400 Mhz. You might recall how APUs are very dependent on memory, so this is going to be a very nice feature for AMD’s shiny new APUs.